What group of letters does the first letter of your last name belong to? Is your last name spelled unusually? Is your last name hyphenated? Is your last name hard to pronounce? Does your last name explicitly reflect your cultural or ethnic background? Do people often address you by your last name only? Do you believe that a person's name can determine how successful he or she will be in life? 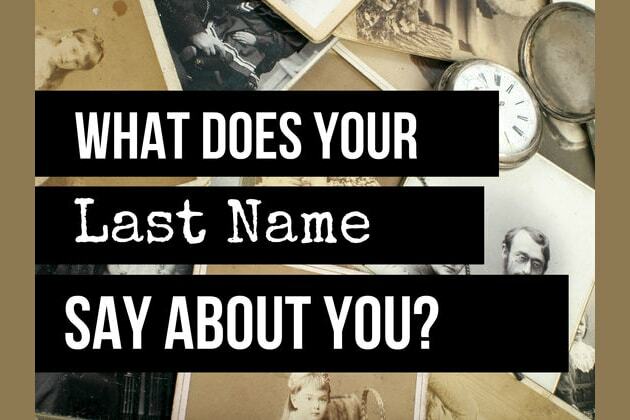 Do you actually like your last name? Your name reflects your uncanny ability to encourage others with your enthusiastic and energetic disposition. Your life has been filled with many twists and turns, yet you always manage to land on your feet after experiencing challenging circumstances. You really are an example to us all! Did we get it right? Tell us in the comments and SHARE your results with family and friends! Your name reflects your rich and unique heritage! You have an alluring aura and an air of confidence that always keeps people guessing! You’re a curious person who loves to seek adventure and have a worldly and cultured point of view. Sophisticated and chic, your name represents success and accomplishment! Your name represents your wildly vivid imagination and creative approach to the world. You are inspired by artistic expression of all kinds and have a colorful and energetic spirit! You have a tendency to look at the big picture, rather than focusing on small details and love to do things spontaneously! Your name is as original as you are and therefore, you’ll have an unforgettable impact on the world around you! Not only does a name like yours represent someone who is cordial and polite, it also symbolizes your unique ability to empathize with others. You are able to see the good in everyone and have a generally optimistic viewpoint towards humanity. The world needs more people like you in it!